April 8, 2015 WHERE HAVE ALL THE AFFORDABLE UNITS GONE? 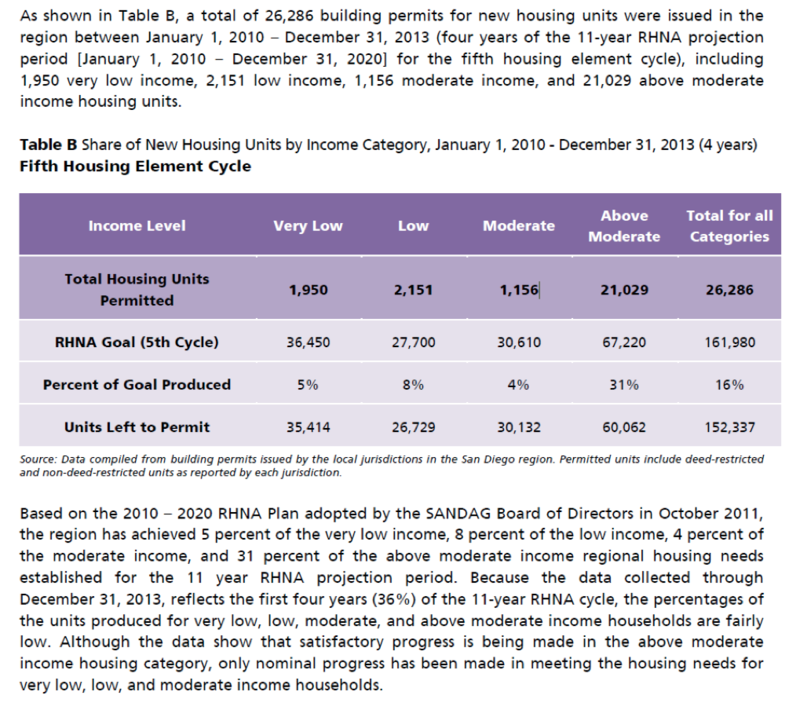 Table B below shows the progress made in satisfying the regional needs of affordable housing in San Diego County. 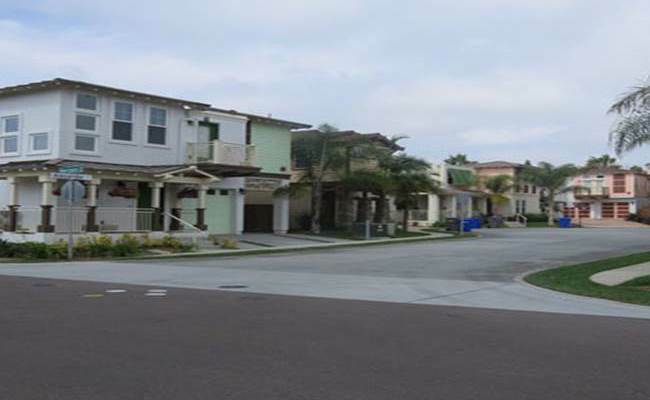 It is SANDAG, the County governmental association, that assigns Encinitas its Regional Housing Needs Assessment (RHNA ) numbers–the total of affordable housing units that the city is required to provide. Note that over a four-year period the assigned RHNA numbers county-wide have only produced 4%-8% of the required affordable housing units. All the rest of the units produced are market rate, doing nothing to satisfy affordable housing demand. The 1,090 affordable units assigned to Encinitas will produce approximately 52 to 104 affordable units and approximately 1196 to 1248 market rate unit, if current trends continue and the current system of assigning RHNA numbers is not changed. The City is embarking on an update of the Housing Element of the General Plan to fulfill the State mandate to provide “affordable housing,” which is the term the State uses to identify housing units for lower-income households. The update of the City’s Housing Element is to satisfy the State requirement to provide 1,090 affordable housing units, as defined by SANDAG’s Regional Housing Need Assessment (RHNA). In mandating, through SANDAG, 1,090 additional “affordable” units in Encinitas, the State does not try to distinguish between public subsidized housing and “affordable” units. The result is a perception that all new housing units added under the proposed plan will be affordable. However, the State provides no oversight to ensure that the new housing is affordable to low-income households. This means that upzoned units will sell at market rate and instead benefit developers. The State Department of Housing and Community Development (HCD) defines “affordable” housing as any property zoned R-30 or higher (30 units per acre). According to Encinitas’ ex-Planning Director Jeff Murphy, HCD “recognizes R-30 as a proxy for affordable housing.” He also states that in reality the R-30 housing will most likely be sold at market rate. The State only requires the City to identify building sites, but there is no requirement that housing units actually be built. Once upzoning occurs, however, developers can build high-density projects, which are often associated with taller buildings. As a justification for an increase in housing density and building height, the City claims there is a need to provide diversified housing for retirees and millenniums. Again, with no State requirement that diversified housing be provided, 100% of the upzoned units may sell at full market rate. The difficulty in providing low-income housing is that Encinitas has some of the highest housing cost in the nation; the median for market rate housing is above $750,000 and climbing. The lowest cost housing is more than $450,000. Because of high land prices in Encinitas, truly affordable housing must be subsidized. Subsidized low-income housing is limited to a family of four at the federal poverty level of $40,000 or an individual with income no more than $27,000. Public funding for building subsidized housing has disappeared. Congress has cut rental subsidies. There is no public transit system in place to support high density and no current plans to provide it. Higher density leads to more traffic congestion, more pollution, and higher demands on scarce water resources. Encinitas is already 90 percent built out.